Earlier this week, contributing colleague, Kirk McElhearn, provided hints for ripping CDs better and faster. Today, I’d like to piggy-back on Kirk’s fine work to provide an overview of just what you can do with CDs within iTunes. Of course, you can pull the contents from CDs and put the results in your iTunes library. By default, when you insert an audio CD, iTunes launches, displays the CD under the Devices heading in iTunes’ Source list, queries the Internet for the CD’s title and track listings, and then tosses up a dialog box that reads “Would you like to import the CD “name of CD” into your iTunes library?” If you click Yes, the contents of the CD are imported using the Import Settings found in iTunes’ General preference. If you have a lot of CDs that you’d like to rip—when you’re ripping your massive collection of Grateful Dead discs, for example—you should travel to that General preference, locate the When You Insert a CD pop-up menu, and choose Import and Eject CD. (Other options in this menu include Show CD, Begin Playing, Ask to Import CD, and Import CD.) Choosing Import and Eject CD means iTunes will go about its ripping business without bothering you for anything other than the next disc you’d like to rip. Before asking iTunes to rip your CD you should consider whether you want tracks imported individually or ganged together into a single track. For example, you might like all the tracks on an audiobook CD to be combined into a single “Disc 1” track, making it easier to navigate the audiobook on an iPod or iPhone. Or, to ensure that a shuffling iPod plays an entire classical work instead of a single movement, combine that work’s component parts into a single unit. To do that, insert a CD, dismiss the “Would you like to import” dialog box, select the CD in iTunes’ Source list, hold down the Shift key, and select the tracks you’d like to combine into a single track. (The tracks must be in sequence—Tracks 2 – 5, for example. You can’t combine Tracks 1, 3, 6, and 8.) Now choose Advanced -> Join CD Tracks. The tracks will be ripped to a single track using the import settings found in the General preference. At one time you could find settings for burning discs in iTunes’ preferences. That’s no longer the case. These settings appear only when you select a playlist and click the Burn Disc button at the bottom of the iTunes window. In this Burn Settings window you have a variety of options. You can choose a preferred speed—1, 2, 4, 6, 8, 16x and so on as well as Maximum Possible. If you routinely see errors when burning your discs at the Maximum Possible setting, try one of the slower settings as that can help (as can choosing “Use Error Correction When Reading Audio CDs” in the Import Settings window accessed through the General preference). Audio CD This is the default option, the one you use for burning CDs that you can play in a CD player such as the one attached to your stereo or in your car. If you’re burning a CD of music that iTunes plays as gapless—The Beatles’ Abbey Road, for example—first select all the tracks in the playlist, press Command-I to produce the Multiple Item Information window, click the Options tab, choose Yes from the Gapless Album pop-up menu, and click OK. Now click Burn Disc at the bottom of the iTunes window. Choose None to create a gapless CD. If you have a CD player that can read track information from CDs and you’d like to view that information when playing the disc, enable the Include CD Text option. If the playlist contains more tracks than will fit on a single CD, iTunes will offer to split the playlist across multiple discs—filling the first to capacity and then asking for additional discs as needed. MP3 CD iTunes can burn MP3 CDs. These are CDs that play in some CD players that contain tracks encoded in the MP3 format. The advantage of these discs is that they can hold more than 12 hours of music. The original tracks must be in the MP3 format (any that aren’t will be skipped when the disc is burned). As with burning audio CDs, if the playlist contains more tracks than can fit on the disc, iTunes will offer to write the remaining tracks to additional discs. The MP3 tracks will appear on the disc organized in folders, with each folder representing an album. The organization of an MP3 CD. 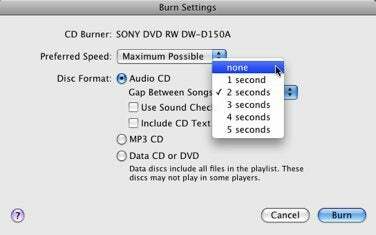 Data CD or DVD Finally, you have the option to burn the contents of your iTunes playlist—audio as well as video—as a data disc. These discs are not playable in any CD or DVD player. Rather, they’re for backing up your data. This option is, regrettably, routinely overlooked by iTunes users. Many people are under the impression that in order to have a backup of their music, they must burn it as an audio CD. That’s a terribly inefficient way to go as audio CDs create files that eat up around 10MB of storage per minute of stereo audio, even if the original file was a tenth of that size. A Data DVD is a good way to back up lots of songs or some videos. For example, Cowboy Junkies’ Lay it Down, purchased from the iTunes Store (in iTunes Plus format), consumes just over 100MB of storage space, yet it eats up an entire audio CD. As a data CD you have room for backing up approximately five more iTunes Plus albums.